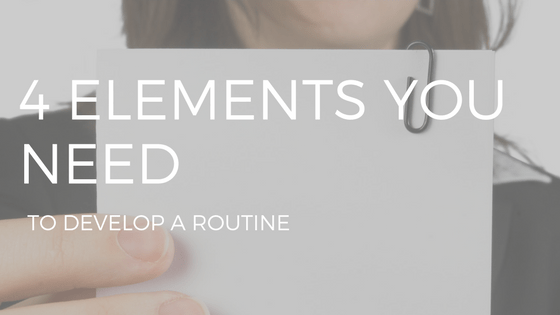 What’s the difference between a habit and a routine? Is it necessary to change your routine in order to create a habit? All great questions. I wanted to clearly understand the differences between habits and routines so I could provide the best guidance and coaching for my clients. 1. a customary or regular course of procedure. 3. regular, unvarying, habitual, unimaginative, or rote procedure. Now that the differences were crystal-clear, it became much easier to address the above questions. While, with thought, we can all make defining distinctions between the two words, I think using them somewhat interchangeably affords us the greatest flexibility when introducing change. It is safe to say that most of our results come from those things we do repeatedly and if we wish for different results, we need to do different things. And then do them again and again. Regardless of whether we prefer “habit” or “routine”, the ultimate definition of each word involves frequency, consistency, replicability and sustainability. These are the crucial four essential drivers of the activities necessary to bring about change and produce different, long-term results. The last of these four – sustainability – seldom takes hold unless we have taken the time to address the foundation upon which sustainability is built. Most attempts at establishing new routines and habits will enjoy early success. Sadly, these initial results are often short-term as we quickly revert to our prior habits and routines. The reason we are able to sustain a routine is because, regardless of whether it is self-imposed or imposed upon us, we have developed a belief in ourselves that supports, and reminds us of, our need to maintain the routine and we will continue to do so until we change our beliefs. When we find ourselves in a rut, it is not because of our environment or any situation we find ourselves in, it is simply because of what we have become to believe to be true of ourselves. Interestingly, many people who are enormously successful in their chosen fields will often describe what they do as boringly routine. What they are really telling us is they found or developed a formula of action that culminates in a successful result for them and that much of their time is spent “boringly” repeating those actions over and over. There is no need for debate as to whether habits or routines bring value. The only debate necessary is the one that focuses on whether the results of these habits and routines are valuable or not. And from that point, common sense suggests that we continue those that bring us the value we desire and abandon or modify those that don’t. Life really is quite simple. There is no need to complicate it.